I made this bento a few days ago when I was feeling pretty ill. I had an odd reaction to some creamy soup I’d had at a restaurant, and had spent the night being friendly with the bathroom. In the morning, I felt very weak and spent, and my stomach felt very tender. But I knew I’d be hungry and very grouchy by lunchtime if I didn’t have anything to eat. 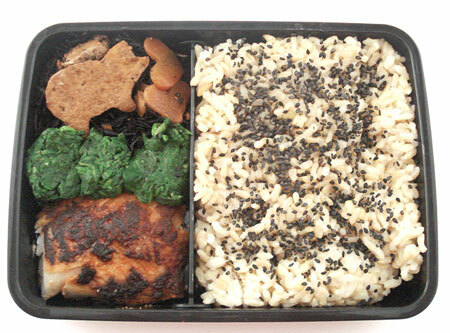 So, I tottered to the kitchen and assembled this bento entirely with staples or johbisai . I had a few packets of this stashed in the freezer, and some of stewed hijiki in the fridge. There were frozen cooked spinach bundles too, and some gomashio, sesame seed salt. So I just defrosted and put things all together for my very simple, easy on the tummy bento. I added a big low-salt umeboshi (pickled plum), because umeboshi is supposed to have healing qualities. It was very simple, but delicious, and because of the sesame seeds, fairly nutritionally balanced. I’d almost say it was Zen-like, though I think this term is way overused so… Chewing on the rice very slowly together with the toasty sesame seeds was really very nice. Oh yes, and it’s totally vegan and gluten-free, and only 400 calories in total. 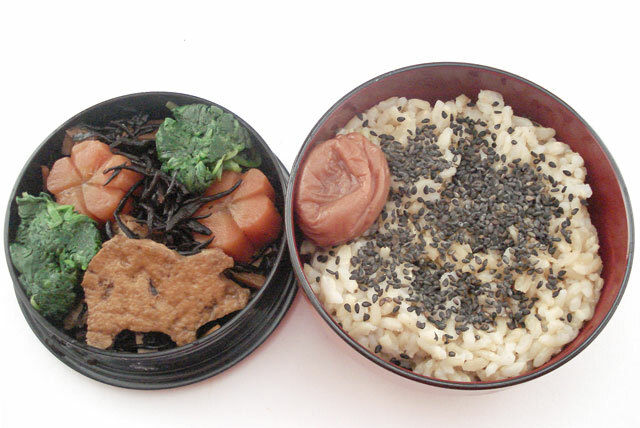 The bento container I used incidentally is the bowl-shaped one I that I used previously for bento no. 12 . I didn’t include a miso ball this time, because the umeboshi and gomashio were already pretty salty. Give the brown rice (or even white rice) with gomashio or other furikake on top kind of bento a try when you are feeling a bit poorly or sluggish. It may be boring to have a bento like this every day, but on occasion it really seems to get the body back into balance.